Imprisoned former Peruvian President Alberto Fujimori has been pardoned by incumbent Leader Pedro Pablo Kuczynski. Kuczynski's office said in a statement that Fujimori, 79, was being released on health grounds, BBC reported. Fujimori — who was in power from 1990 to 2000 — was recently taken from prison to hospital because of low blood pressure and abnormal heart rhythm. He has been serving a 25-year sentence for human rights abuses and corruption. He remains a divisive figure in Peru. He is admired by some Peruvians for combating Maoist rebels, whereas his critics consider him a corrupt dictator. Fujimori has been in and out of hospital for a variety of health problems in recent years. The presidential pardon comes just days after Fujimori's supporters in Congress helped Kuczynski avoid impeachment over alleged corruption. Opposition politicians allege that the president had promised the supporters to free Fujimori in exchange for their backing. What was Fujimori convicted of? In 2007, he was sentenced to six years in jail for bribery and abuse of power. 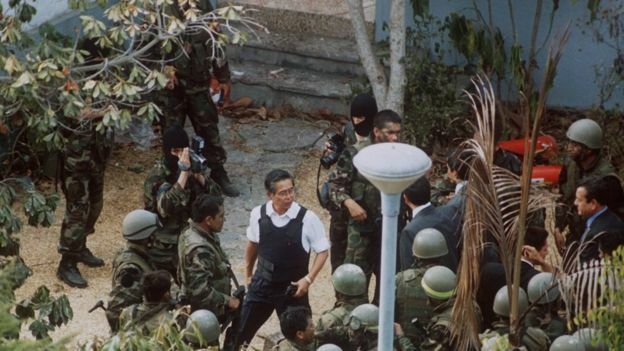 In 2009, he was sentenced to another 25 years in prison for human rights abuses committed during his time in office, including authorizing killings carried out by death squads. He implemented a radical program of free-market reforms, reducing the role of the state in almost all spheres of the economy. Though this shock therapy brought great hardship for ordinary Peruvians, it ended rampant hyperinflation and paved the way for sustained economic growth in the second half of the 1990s. Fujimori also tackled the left-wing rebels whose 10-year insurgency caused thousands of deaths. But he said he never approved a ‘dirty war’ against the rebels. In 1992, with the support of the military, the president dissolved the Peruvian congress and courts and seized dictatorial powers. He justified the measure by arguing that the legislative and judiciary had been hindering the security forces in their fight against the rebels. Opposition politicians said he was really seeking to escape democratic accountability. In his second term which started in 1995, Peruvians began to voice concern that the methods used against the insurgency were also being employed against the president's democratic opponents. His critics accused him of using the intelligence service led by Vladimiro Montesinos to intimidate and spy on rivals. They said he exerted unfair control on the media and the judiciary, and used government resources to support his own campaigns. This criticism increased when he announced he was to stand for an unprecedented third successive term. Although he won the May 2000 elections, the victory marked the start of his downfall. A tape emerged showing Montesinos apparently bribing an opposition member of Congress. In November 2000, he fled to his parents' native Japan, where he lived for five years in self-imposed exile. In an effort to resurrect his political career, he flew to Chile in November 2005, only to be arrested at the request of the Peruvian authorities.